I would like to wish all my customers, friends and Second Life family a very happy Easter. On high holidays such as Easter, my mind always travels back to other Easters in the past. One thing that a Canadian Easter, at least in my part of Ontario, is never without is lilies. You see them everywhere in real life, and here they are, in all their glory … waiting for you to take one home or gift to a loved one. Each stem, flower and leaf is meticulously arranged by hand in a configuration that best fits the container. White lilies, my favourite at any time of year, but especially at Easter. Not sure how often this striking blue appears on lilies in nature, but it sure looks yummy, doesn’t it? Bright sunshiny yellow – makes me think of little newborn chicks, and fat waxy daffodils. Last but not least, a flamboyant colour sure to make one take a second look. 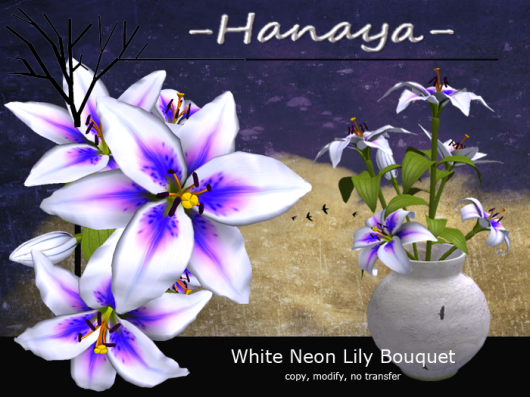 All of the brand new -Hanaya- Lily Bouquets are available at our in-world store (look for them in the New Releases section), and on the Second Life Marketplace for home shopping and gifting. This entry was posted in Product Announcements on April 21, 2011 by moriko. Now that the nice weather is here, I was inspired to create a garden bench. This one, like many of my other products, is based on one that I owned in real life. The bench consists of 2 sculpts created by me, and contains 6 looped animations for girls, 3 on each side of the bench. A single person can sit on the right or left side, or 2 people can sit together. And yea .. I know, no male sits in this one. 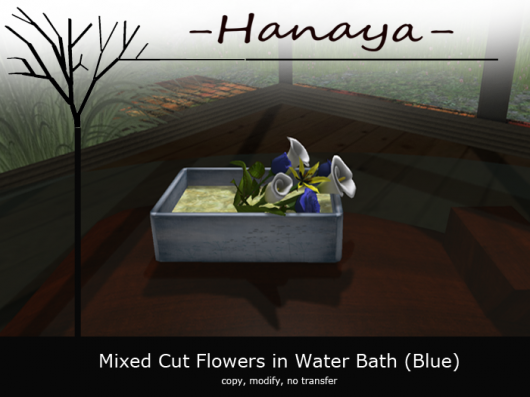 The -Hanaya- Buddy Bench (animations for 2 guys), and the -Hanaya- Garden Bench for Couples will be coming out in the next few weeks. The product includes a tea rose bush in a custom-made planter that matches the bench, with exquisitely sculpted roses – that makes the planter kind of primmy. I am excited about this bench, because it is a first product that I created with Perfect Sitter scripts, which make it so so easy for the end user to change animations. Adjustment of the position and rotation of the individual animations is also very easy, but the defaults should work without adjustment for avatars of average heights. The Girlfriends Garden Bench is available for purchase at our in-world store, and is rezzed there so you can try it out. Or buy it at our web store on the Second Life Market Place if you wish to take advantage of home shopping or buy as gift for a friend. This entry was posted in Product Announcements on April 18, 2011 by moriko. The exhibit, which includes 9 new pieces, opened on April 15th and continues until May 31st, 2011. A list of the art on exhibit is available at the gallery at Taliesin Shores sim. The real life person behind the avatar known as Moriko Inshan has had a passion for nature, art and photography since early childhood. Nourished early on by Sunday nature hikes with her parents in the countryside near Prague, her love of the outdoors grew during her many years of exploring eastern Canada and the Atlantic coast of the northern United States. 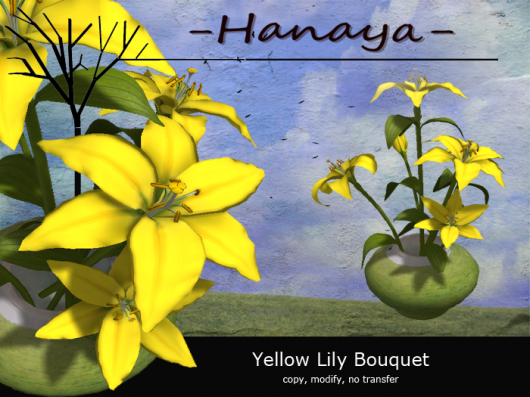 A certified Master Gardener, her leisure time is divided between her real life garden, landscaping and the creation of sculpted flowers and art in Second Life. Her love of nature filters through the lens of her camera and her graphics pen into her images, connecting her to her subject. Images are digitally post-processed, often utilizing hand-drawing and blending techniques on a Wacom tablet. She currently lives happily near Frankfurt, Germany with her husband and longs for frequent visits from their two children. This entry was posted in Events, News on April 16, 2011 by moriko. First, happy Friday to all my readers, group/subscribo members and friends. 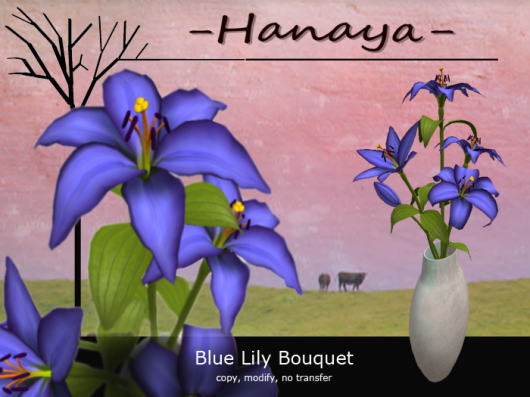 I hope you have a little bit of time this weekend, because I would like to invite you to two events of which -Hanaya- is part. One is an exhibit of -HanayaArt- titled ‘through my eyes’ at the Chapter House Gallery, which opens today. Today is also the opening of the Little Big Shop Fair, which funds a worthwhile cause – the Water Project, which will bring ways and means to provide clean water to Africa. 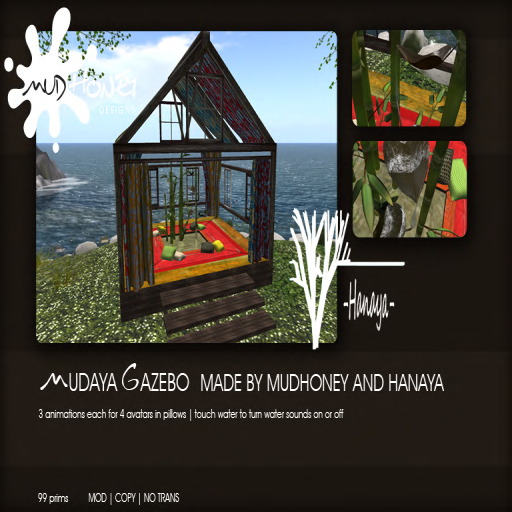 We are partnered with MudHoney and have several new releases as well as a collaborative item, the Mudaya Gazebo, at the fair. 100% of the sale proceeds from the Well of Wishes, a brand new release, go to the Water Project fundraiser. The well was built using a sculpt map by yours truly. 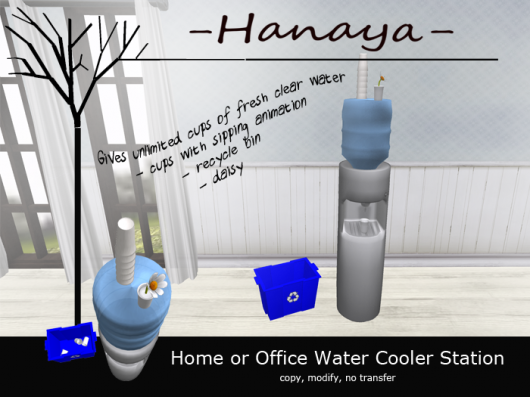 We also have several new releases, available at the Little Big Shop Fair – the Home or Office Water Cooler Station and Mixed Cut Flowers in Water Bath (Blue). Both of these products will also be available at our main store and on the Second Life Marketplace sometime this weekend. This entry was posted in Events, News, Product Announcements on April 15, 2011 by moriko. April Group & Subscribo Gifts are out! This silly little bunny has been working her fluffy tail off, making gifts and charity items in the last few weeks. It is fun and is always better to give then to receive, right? So .. for my yummy friends in the store group, here is April’s group gift, a low prim handpainted screen with a single but awesome calla lily in a vase. 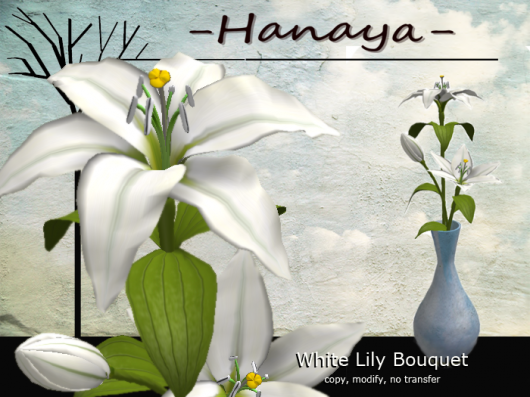 The screen is reversible, and the whole thing is mod/copy, so you can unlink the vase & lily and place as you wish. The screen is another custom sculpt creation from little bunny me, with limited edition textures from Distressed. For my subscribo friends, and wow … there are lots of you guys now … I made a garden ornament. 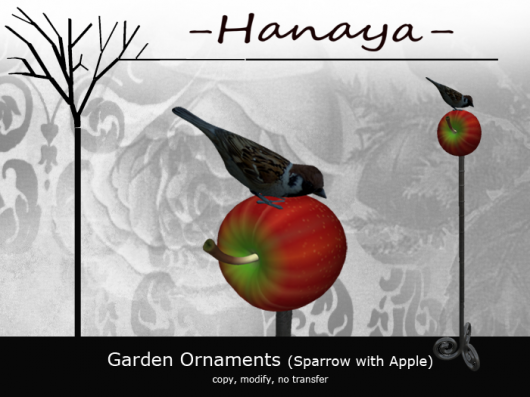 A cute little sparrow sitting on a juicy red apple, mounted on a wrought iron stand. And do pop by the store if you have time, all three hunts we are in have officially started. 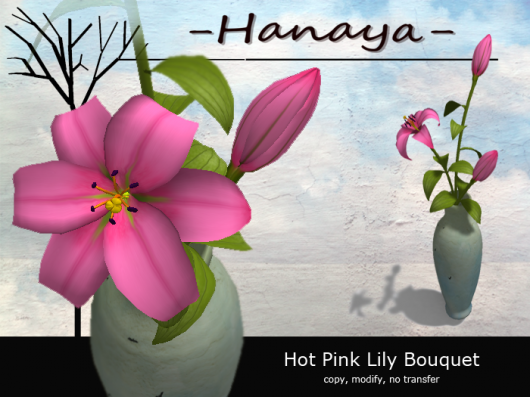 This entry was posted in Freebies and Gifts on April 1, 2011 by moriko.